The UK's presence at this year's Venice Biennale is particularly strong, with Phyllida Barlow's sculptures at the British Pavilion, Rachel Maclean's new film for Scotland + Venice, James Richards' sound and film work representing Wales, and the new Diaspora Pavilion reflecting the diverse cultural backgrounds of UK-based artists. Moira Jeffrey reports. 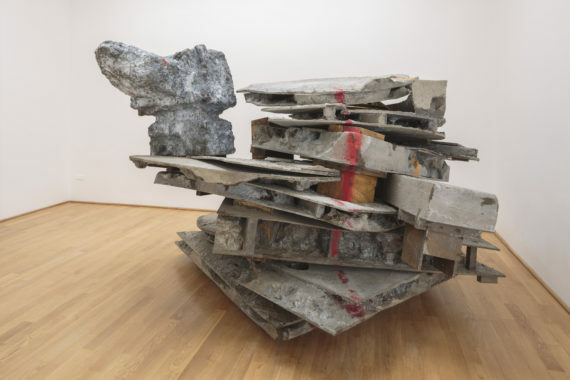 Phyllida Barlow’s exhibition for the British Pavilion at the 57th Venice Biennale is entitled folly. It serves as a reminder of a careful equilibrium in her art. It is both purposeful, through its relationship with utilitarian building materials such as concrete and plywood, cement and wire mesh, and also improvised, speculative and comically architectural. Corralled in a show of more than 20 discrete works of art is a teetering balcony that looks out onto the lagoon, a giant, bashed-up cardboard axle that might have fallen off a toy truck, an upturned cardboard box that spills timber planks and resembles a tree in a kind of subliminal comic riff on its arboreal origins. But the word ‘folly’ might also act as a kind of warning. Perhaps by the 73 year-old artist to herself or perhaps to others, to stick – as she has done – with a sculptural language that seems true to her chosen project. The biennale is unique opportunity not just for artist to speak unto artist, but for nation to speak unto nation. And collector to collector and commercial gallery to commercial gallery in the most hubristic display of soft power and cultural authority. Its risks to artistic integrity are immense. Once, the shadow of Roman Abramovich’s superyacht cast an appalling chill on the city’s biennale. This year it is the lurking presence of Damien Hirst’s folie de grandeur, ‘Treasures from the Wreck of the Unbelievable’. The vast, two-museum show is the puffed-up monster in the lagoon that no one wants to talk about. 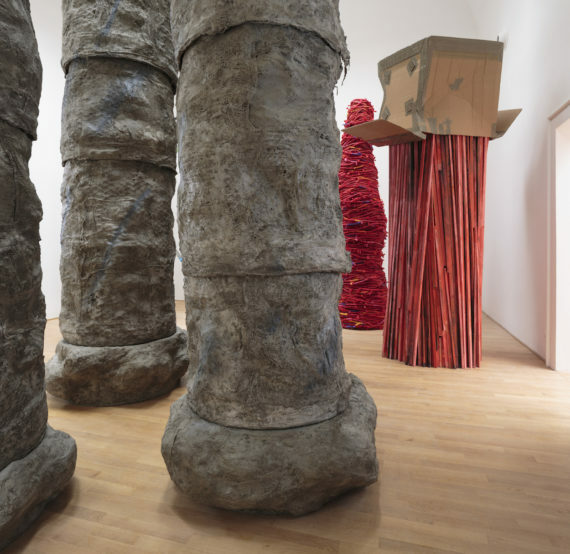 Vast and structurally complex as Barlow’s exhibition is, bolstered by all its official status in the city’s Giardini and the heavyweight commercial punch of her gallery Hauser & Wirth, it still remains on the other end of the scale: consistent with her interests and methods. Her great, grey ionic columns are made not of marble but of cement and slashed at the waist. In a city of monuments, her coiled red fabric tower stands contrapposto rather than phallically erect. Barlow’s folly sits next to the Canadian Pavilion, where Geoffrey Farmer has unroofed the building and where a rushing geyser of water dampens the building every few minutes. The sight of the pavilion staff daily sweeping the water that consequently seeps around the back of the British Pavilion is oddly moving. At the church of Santa Maria De Ausiliatrice, where James Richards is showing for Wales in Venice, you can see where the water sometimes rises in the wet months of the year. The artist has let the daylight in, revealing the scarred and slightly shabby walls beside the altar. Visitors can sit on a star-shaped padded bench and listen to the sound installation, Music for the Gift, in which Richards and his collaborators Kirsten Evans and Samuel Williams from the Royal Welsh College of Music and Drama have reinvented choral music for the secular age. The six-channel work builds a sonic space that both cleverly and precisely defines the parameters of the building and tries – through repetition of motifs, a collage of sounds and incantatory musical techniques – to transcend them with emotional range. That question of the limits and boundaries of the body is central to What weakens the flesh is the flesh itself, a video made with Richards’ collaborator Steve Reinke, about the ways that the male body might be broken or constricted by external forces, or transformed through self will. Richards’ fluid approach through his digital remodelling of found imagery and his characteristically pulsing, liquid aesthetic creates a work that is by turns oppressive and transformative. At times the work seems part of a pervasive cultural nostalgia for the experiments of the body and video art of the 1980s as means of outrunning the digital era. But Richards really does defy easy categorisation or simple appropriation. Most striking is his use of the extraordinary archive of Albrecht Becker, a German production designer imprisoned by the Nazis for his homosexuality. 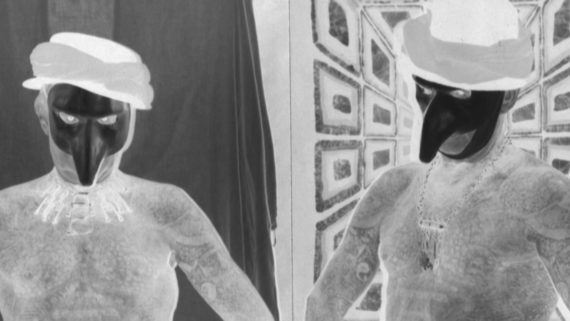 Becker’s attempts in later life to transform his body through extreme genital modification and whole body tattooing, along with his private photographic archive in which he transformed his own image through doubling and multiplication, still speaks to our responses to questions of visibility and the permeability of the body. For Scotland + Venice, multiplicity is an understatement for the work of Rachel Maclean, a video artist whose body of work since her student years has featured her own image transformed by make up and prosthetics. 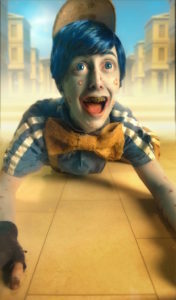 After the candy-coloured aesthetic of works like Feed Me – her satire on social media which featured in 2015’s British Art Show 8 – her new film Spite Your Face is a triumphant and searing indictment of the age of Trump and Brexit, rendered in the deep blue of lapis lazuli and the temporary sheen of cheap gilt. Maclean is not afraid of the obvious and if the moral of her tale – all that glitters is not gold – is familiar, it’s a dizzying and disturbing ride based on the 19th century picaresque tale of Pinocchio and set in the austere beauty of Chiesa di Santa Caterina, a deconsecrated church where mendicant friars once took vows of poverty. Maclean’s hapless anti-hero Pic is trapped in a cycle of aspiration and desperation, a street urchin in ailing Adidas who longs to live in Trumpian luxury. When he ascends in wealth and status as the face of a cheap perfume named Untruth, he undergoes a swift increase in bling and a steep descent in virtue. As Pic descends into sexual violence and brutality, the artist in disguise is both perpetrator and victim. A powerful element of Maclean’s post-production trickery is in her creation of complete and oppressive visual worlds. This one recalls Peter Greenaway’s Rome, viewed through the marksman’s scope in a brutal video game. The artist wrote the screenplay in Venice in December when the canals are dark and inky and gleaming. Water is inescapable too, in anger and dread, in the excellent Diaspora Pavilion at the Palazzo Pisani. 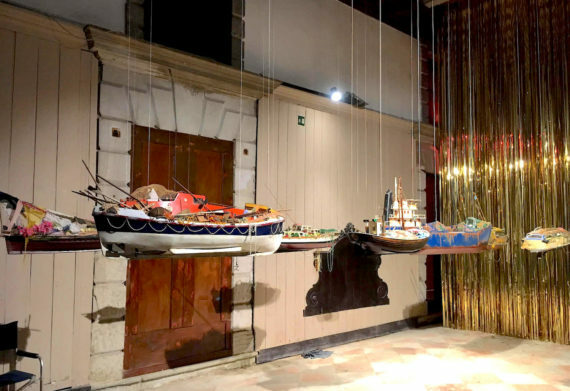 Here, Isaac Julien’s 2007 film The Leopard, about the crisis of Africans crossing clandestinely to Sicily, sits near a gorgeous 2010 Ellen Gallagher projection and a flotilla of tiny, and fragile sculptural boats by Hew Locke. If the official biennale presentation, curated this year by Christine Macel, seems lacking in politics, this is one of the city’s pockets where the conversation about global migration, the nature of diaspora and domestic diversity seems alive and important. The Diaspora Pavilion is part of a much wider project by the International Curators Forum and the University of the Arts London that brings 12 artists of diverse cultural backgrounds into contact with mentors of a more established generation. 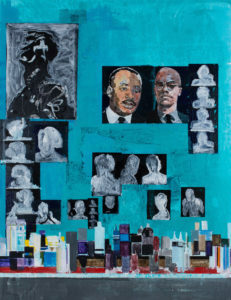 Its sense of political urgency, curatorial energy and collegiate goodwill is reflected both in the work itself and a strategic position that suggests remodelling the British art world to far better reflect its citizens’ origins and experiences. The Palazzo Pisani is an angry, desperate place in moments, but it is also full of hope. 4. 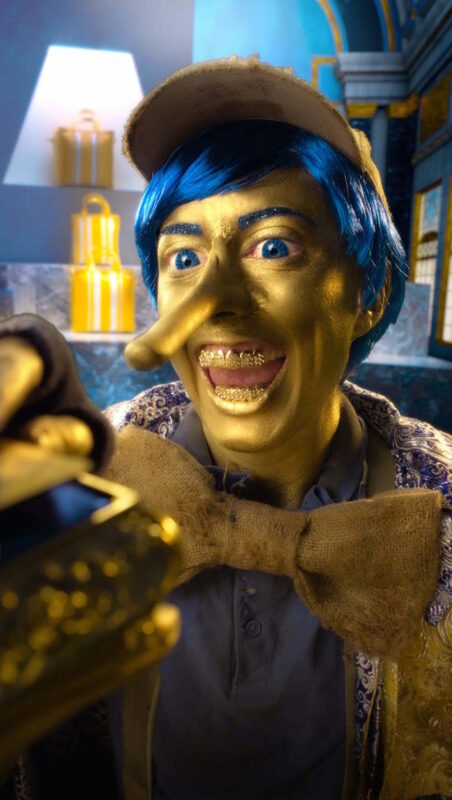 Rachel Maclean, Spite Your Face, 2017, digital video (still). Commissioned by Alchemy Film & Arts in partnership with Talbot Rice Gallery and the University of Edinburgh on behalf of Scotland + Venice. Courtesy: the artist.